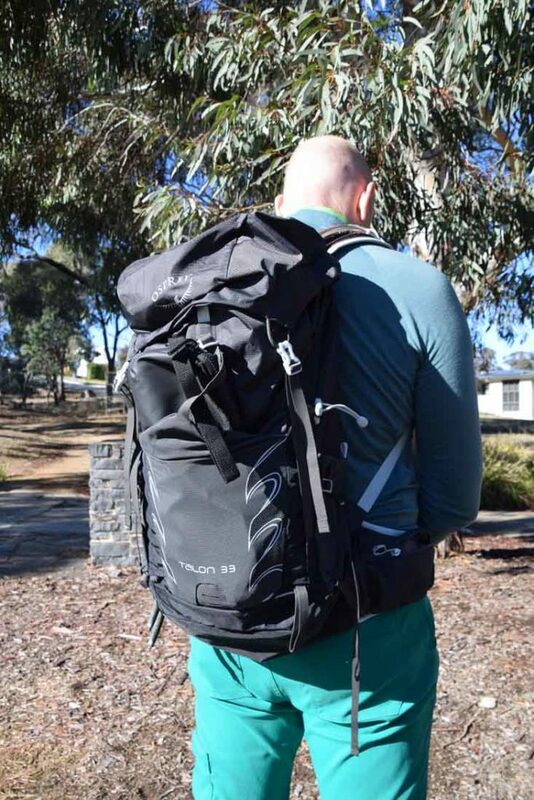 I own two day packs that I use for shorter hikes, one a smaller 25 litre size and a larger 35 litre pack. Which one I take with me really depends on what I’m carrying and the weather conditions. Both these packs are getting on in age so recently when I was cruising the outdoor stores and discovered that there was a very generous sale on I decided that it was time for a new pack to enter the family. After about 30 minutes of working my though all the packs on the display wall I decided that the Osprey Talon 33 was what I wanted. It had all the features that I was after and it felt comfortable both with and without much weight. This pack is essentially a smaller version of a larger pack as has most of the features you would expect from a full sized pack. 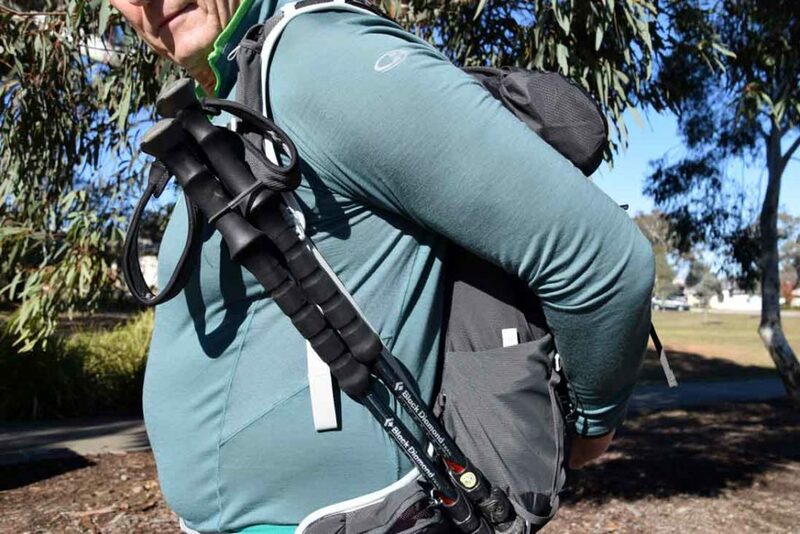 On the plus size this pack carries the weight very comfortably with the harness system allowing descent air movement across the back so keeping the sweating to a minimum. 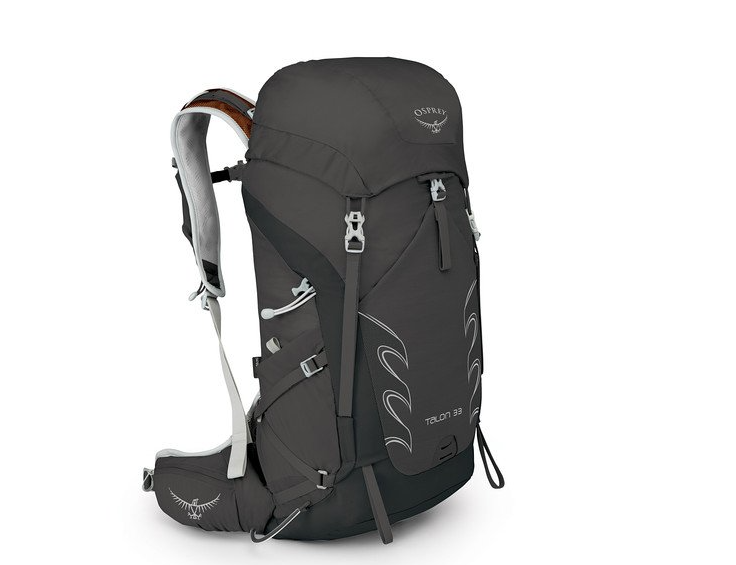 Osprey recommended weight carry for this pack between 7-13kg and I find that with my typical carry for a longer day walk that even at the heavier end of the range that this pack it very comfortable. 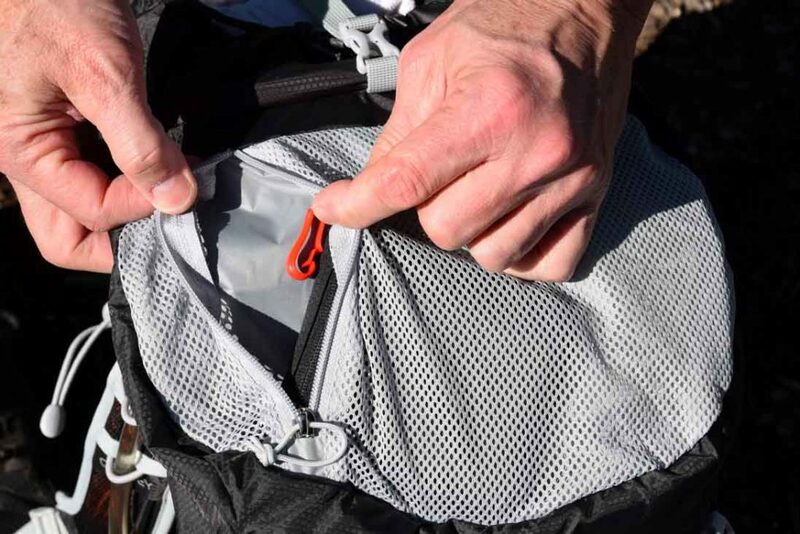 As a smaller version of a full sized pack there is a pack brain that also has an internal mesh pocket which is where I usually store valuables and keys that I don’t plan on using very often. 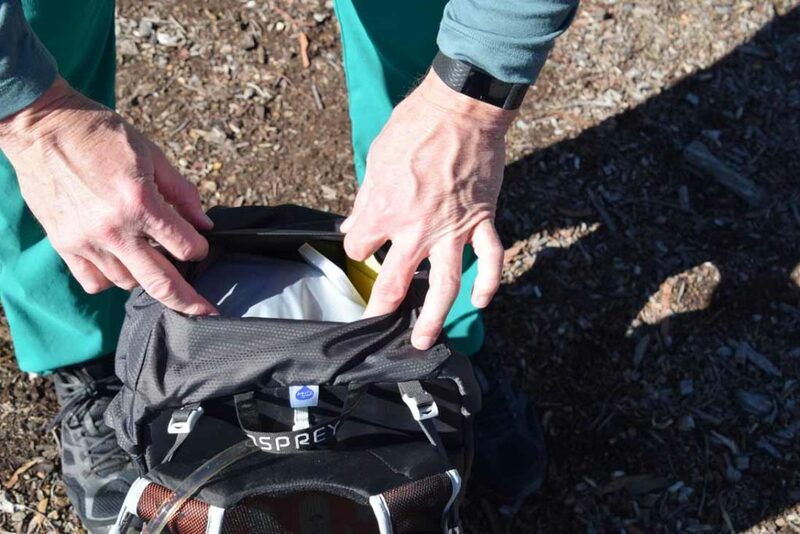 This pack has an external hydration bladder that sits between the main body of the pack and the suspension system and this allows for you to direct the drinking nozzle to either side of the pack. 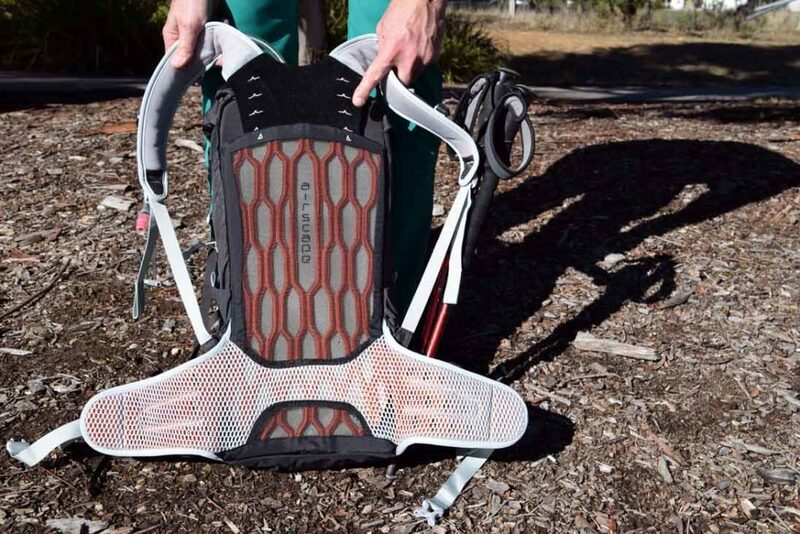 The other big advantage of this system is that it tends to put a bit of pressure on the bladder which makes drinking that much easier and also allows the water bladder to provide a bit more padding on the back. 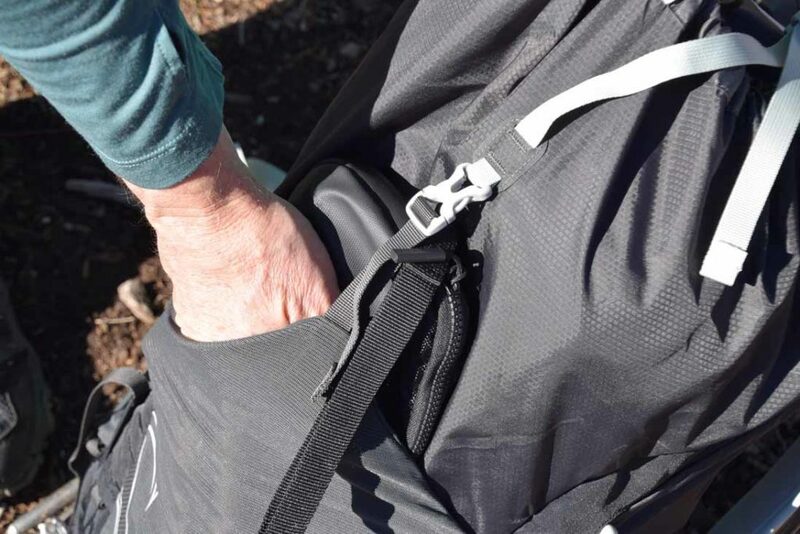 The front of this pack is pretty typical of most packs these days and the sternum strap has the ability to slide up and down for about 125mm tp allow you to get the strap in just the correct position. 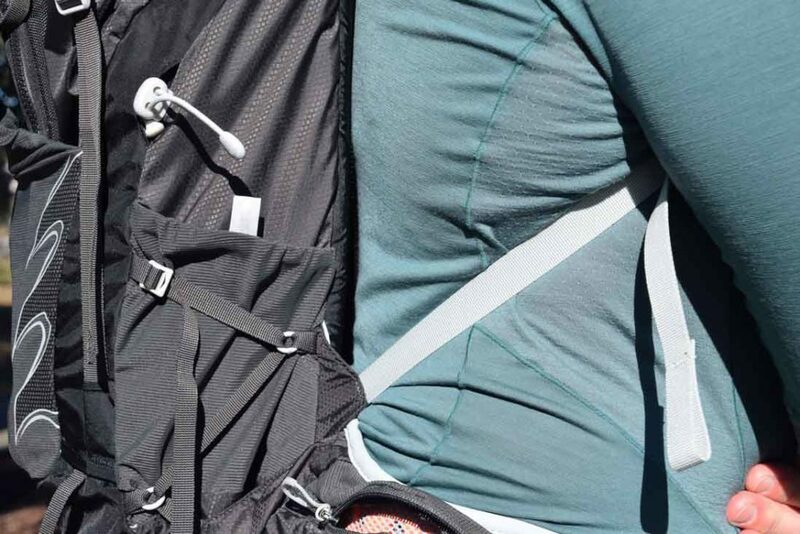 The left shoulder strap has a small mesh pocket and this is a feature that I have come to love from Osprey. I typically put my hand sanitiser in this pocket so I always know where it is wither day or night. 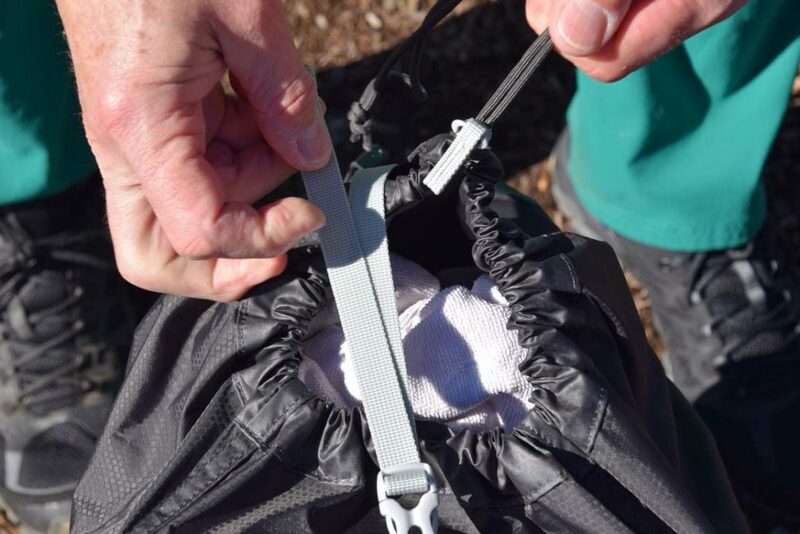 There is also a large stretch pocket on the rear of the pack for stuffing jackets and rain gear and tis is a feature that I will always look for in any pack. There are two pockets on the hip belt that are generous in size, particularly for this small pack and I can quite comfortably fit a compact camera in one pocket with snacks in the other. 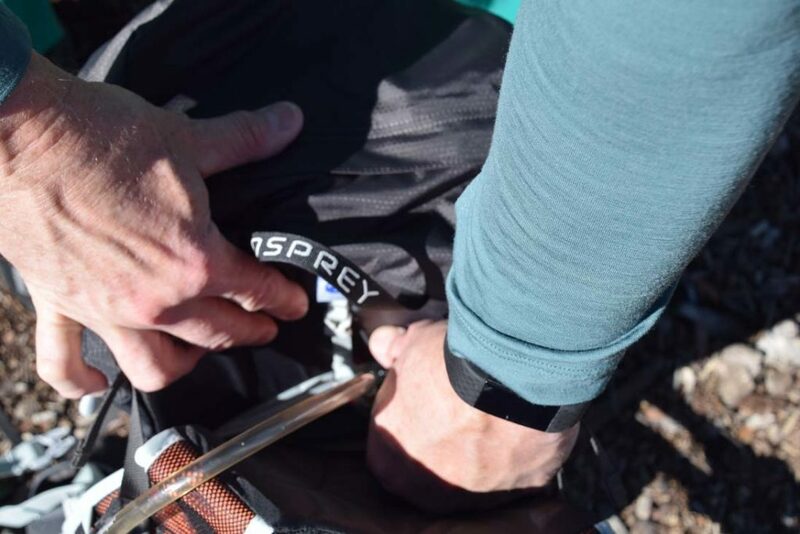 Like most Osprey packs this pack also contains the ‘Stow on the go’ trekking pole storage system. This system does take a bit of getting used to but once you learn to use it it is fatly easy to store your poles without stopping. Now for the negatives. 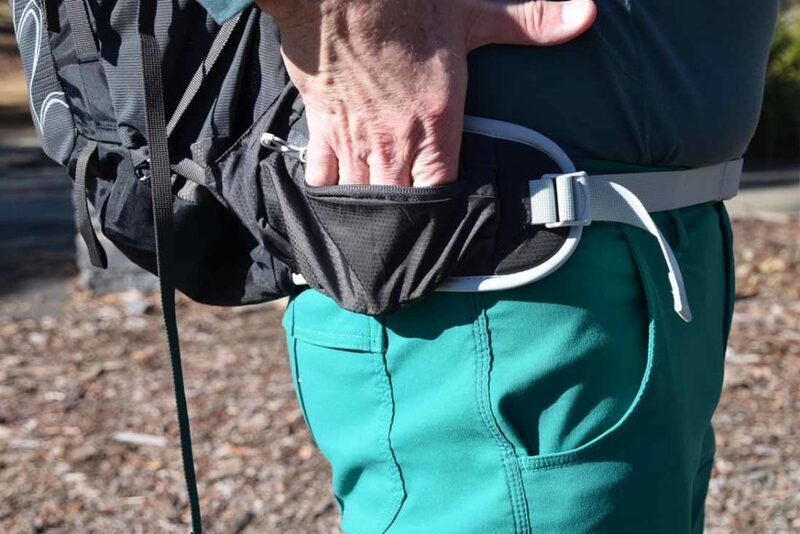 The zips on the hip belt pockets are a bit fine and stiff so you really need to use two hands or get very creative with your fingers in opening the zip. 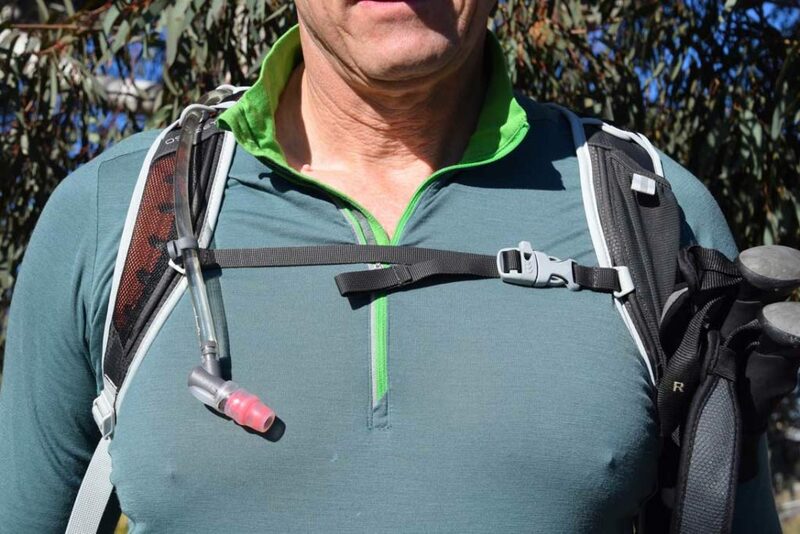 A more robust zip would make this action a bit easier. The internal mesh that lines the suspension system and hip belt is a light grey and while this is a first world problem I would have preferred it to be black so as to not show any dirt that I know will build up over the expected years of use. The hip belt is fairly fine an while this is not a problems it would have been better if it was longer. I’m carrying a bit of extra padding around my waist at the moment but even so I would only ever wear the M/L size. Having said that if your waist is anything bigger than 40 inches you may not have enough hip belt length particular during winter when the clothing gets a bit bulky. Price is also an issue on just about all day packs. If you buy the cheap no name versions you will certainly pay less but typically you loose all the features that the major brands put into their packs. Keep an eye out for the regular sales that crop up and all of sudden these packs become much more affordable. I have been very happy with this pack so far and would happily recommend it as a good large sized day pack. This pack also has a female version called the Tempest which also comes in a range of sizes. At $170.00 this pack is a bit on the expensive side for a day pack which was why I waited until the annual sales came up to purchase at a great price. Keep an eye out for sales but if you can’t wait I still think its worth purchasing. I would prefer the suspension mesh to be a darker colour that doesn’t show dirt.